With Christmas just a couple of weeks away at this point, you’re running out of time to snag the perfect gifts for all the people left on your list. Lucky for you, a shiny new Instant Pot is the perfect git for just about anyone. 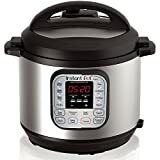 Amazon is running a pair of sales on Friday that could be the last great Instant Pot deals of the season. 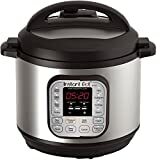 You can snag the $100 Instant Pot DUO60 6 Qt 7-in-1 Multi-Use Programmable Pressure Cooker on sale for $69.95 right now, while the larger $140 Instant Pot DUO80 8 Qt 7-in-1 Multi- Use Programmable Pressure Cooker model is on sale for $99.95. There’s no telling when these deals will be done, so grab one (or two) now while they’re discounted.